tl;dr Pinot officially entered incubation with Apache. ThirdEye is part of the Apache Pinot platform and we recently added Quick Start support, so you can try it out hands-on in less than 15min. ThirdEye is capable of generating synthetic dimensional time series on the fly for cool demos and for testing your own detection algorithms later down the line. Over the past several months we streamlined the setup process for ThirdEye in brand-new environments. Extensible and customizable software is great, but requiring a big up-front time investment just to try it out isn’t. Interactive analysis and visualization are core features of ThirdEye and we want you to be able to experience this directly. An interesting challenge in setting up and/or demoing ThirdEye in a new environment is the need for useful data for analysis and visualization. We originally planned to use existing data sets, either by anonymizing system metrics we have here at LinkedIn or using publicly available time series data, e.g. financial data or our cloud workload traces. We ultimately decided to go beyond static data and generate synthetic time series on the fly instead. This not only provides infinite supply for demonstration purposes, but also enables our algorithm developers to test and debug new algorithms with previously unseen data. As an additional benefit, model-generated data is portable, well-described and and takes up minimal amounts of space. A core value proposition of ThirdEye’s interactive analysis is the ability to slice-and-dice data on demand. For synthetic time series this means that we need to actually generate this data with dimensional information in the first place – and the dimensional data must remain consistent for the duration of the analysis. As we wanted to make model-generated data useful for algorithm testing as well, we attempted to enable as much customization as possible without overwhelming users evaluating our platform. One part of this are sensible default settings, another is retaining the ability for fine-grained configuration and customization. Finding the right trade-offs here isn’t trivial and there will always be room for improvements in the future. On the positive side, we can customize time series amplitude and noise at different frequencies for each individual sub-dimension. ThirdEye is satisfied with only the mean value for a given sub-dimension at minimum. We initialize a Gaussian noise component and the additive daily and weekly seasonality components with defaults that can be overridden as needed. ThirdEye furthermore only creates data for dimension-combinations explicitly defined in the configuration, so you can express gaps in the data by omitting “Safari on Windows Mobile on Pixel 2” (in theory at least). On the negative side, there is the sheer size of the configuration for high-dimensional data which becomes intractable for 5+ dimensions, e.g. 50 countries x 20 page ids x 10 browsers x 10 operating systems x 10 devices = 1m combinations. The flip side is that many combinations may not actually appear in the wild. Another, more subtle, disadvantage is the inability to synthesize non-additive data sets at this time. Overall, this setup has served us well for testing internally and we are confident you will get the hang of modifying existing and generating your own mock data quickly – simply look over the sample config files. Another need for the effective setup of a tool like ThirdEye is the seamless transition from testing to full integration. We made several changes to enable incremental step-by-step integration with your existing infrastructure from “fully isolated and synthetic” to “all real” and already tested the procedure with our partners. Our Quick Start guide contains (optional) steps to integrate data from your existing Pinot cluster. Once you’re set up you can trivially remove the synthetic data source, and what retains is an integrated and fully functional installation of ThirdEye. 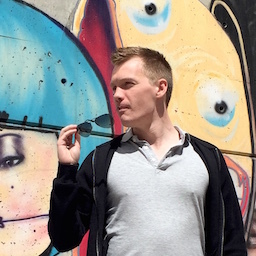 tl;dr ThirdEye comes batteries included with detection methods that cover most use-cases. Here’s an overview of major issues that effective detection needs to consider. And because I know you just can’t wait to roll your own detection logic, ThirdEye also includes a powerful debugger UI for algorithm development and tuning. ThirdEye is an open-source monitoring platform for business and system metrics. It’s part of the Pinot analytics platform and comes batteries included. While ThirdEye supports proprietary algorithm plugins to cover specialized requirements, we’ve also implemented a number of detection methods in open-source that cover a wide range of typical use-cases. True to Pareto they cover 80 percent of use-cases for 20 percent of the effort. They are also transparent and easy to understand for first-time adopters. Rather than launching into a detailed methodology section I’d like to give an idea of the day-to-day challenges ThirdEye faces monitoring various metrics at LinkedIn effectively. ThirdEye primarily covers time series with a granularity between 1 minute and daily intervals. Different types of time series range from smooth aggregate business metrics, such as page views to jittery system metrics such as latency percentiles and error rates. While each of type of metric has its own challenges, there are common aspects. We frequently observe weekly and daily seasonality in business metrics, which isn’t surprising. A professional networking website like LinkedIn would be expected to see most of its traffic during during daytime and weekdays and less traffic during night time and weekends. Hard-coding this behavior by itself is ineffective, however, as other activity such as weekly batch computation on Hadoop clusters may execute primarily during low traffic periods. When we implemented general-purpose detection methods, we therefore focused on accurate handling of specific weekly and daily patterns by default. In other words we want to achieve great detection performance (high precision and recall) on data with seasonality without requiring any additional configuration from the user. In addition to obvious daily and weekly patterns there are calendar effects throughout the year that need not occur in precise intervals and may affect only “part of” a metric. Depending on the monitoring use-case this effect may be considered “anomalous” or fully expected and unremarkable. An example for this is the Easter holiday across many parts of Europe. The start of the Easter holiday is determined by the type of calendar (Julian vs Gregorian) and moon phases. The holiday turns into a one-and-a-half week long vacation for families with school-age children while it’s merely a long weekend for most young professionals. It therefore impacts different segments of user in different ways, which also translates to differentiated impact on system metrics. Here ThirdEye’s detection algorithms benefit from the knowledge base of ThirdEye’s Root-Cause Analysis (RCA) component. RCA already tracks holiday databases and extracts relationships between your computer systems and metrics from meta data, configuration, and previous analysis sessions. Additionally, ThirdEye allows users to track future expected events and their impact on specific metrics. Naturally, while this approach covers major metrics the stored knowledge can ever be fully complete. If ThirdEye still detects an anomaly that users consider “expected”, such as a drop in website traffic during the July 4th weekend in the US, we do the next best thing avoid alerting about the “bounce-back” the following business days (but ThirdEye would alert you in case of a lack thereof). These are the “anomalies” in anomaly detection, such as a server failure causing a spike in error rates or a holiday decreasing desktop-based page views. Affected metrics temporarily deviate from their usual behavior and are expected to move back into line once the root-cause has been mitigated. Detecting the anomaly is only part of the problem however. The other is figuring out what would have happened without this anomaly. This is relevant for both root-cause analysis as well as correct detection of outliers in the future. For detection to be automated we cannot simply rely on rules defined by expert users across thousands of metrics. Rather we have to learn from time series behavior, extract relevant features, and fit an effective model. Unfortunately, the real world isn’t a clean room laboratory and outliers in the training data can be detrimental to model fit and detection performance. When the system has been monitoring a (similar) metric for a longer time and a set of user-labeled outlier regions is available, excluding data anomalies is easy. Bootstrapping the monitoring process from scratch for a previously unknown metric in an automated way is non-trivial. Exclude too much and detection becomes noisy, don’t exclude enough and detection may miss critical outliers in the future. For example, if a mid-week holiday decreases page traffic this week we may want to send out an alert, but we do not want to alert anyone the following week when the traffic returns to normal levels. Therefore, the outlier period needs to be excluded from any future baseline computation. This can become tricky when multiple anomalies overlap or appear in rapid succession or when there are strong underlying trends in the data. Another common issue of anomaly detection in a production environment is low data quality. A general-purpose monitoring service like ThirdEye supports data ingestion from many different sources. When not supported by a scalable analytics store like Pinot, some users prefer data quantity over data quality especially when ongoing production issues (found by ThirdEye) are prioritized over maintaining internal ETL pipelines. Thus, we sometimes find ourselves confronted with gaps or intermittent data dropout. We support algorithms in ThirdEye with a library of common smoothing methods and tools that are resistant to noise. There isn’t any free lunch here, as tolerance to noise comes with a potential degradation in detection latency. For a example, if a time series frequently sees dropout of data points ThirdEye alerts may be delayed by another data point or two until we are sufficiently certain that an observed deviation indeed comes from the underlying metric rather than ingestion process. Many built-in algorithms can tolerate data dropout with a trade-off for either precision or detection latency (or a well-maintained ETL pipeline and analytics system). From our practical experience of operating ThirdEye here at LinkedIn we know that this choice is use-case and team-specific and can therefore managed via alert-specific configuration. Finally, the only constant in a growing business is change. The best model eventually becomes useless as the world around it changes. Business changes, technologies are replaced, and your product’s end-users will always find a way to surprise you. This change also reflects itself in the metrics monitored by ThirdEye. Detection algorithms in ThirdEye handle this change in different ways: from moving windows and exponential decay to change-point detection from temporal distributional change or even manual user-input. And while accurate change point detection is already challenging we often cannot just stop monitoring a recently changed metric until sufficient data has accumulated to re-fit fitting a model after a change point. ThirdEye implements methods that attempt to project properties from the previous sample onto the changed time series. For example, this allows us to detect unexpected effects of ramp up in A/B tests as anomalies but continue to monitor the metric reasonably well at the new, higher level by re-using established seasonality but scaling expected mean and variance proportionally. While this topic deserves an article by itself, I think this example conveys the fundamental principle. With many methods and heuristics implemented in ThirdEye we still have not found a silver bullet to reliably address all of these concerns at all times. We therefore set out to make it easy for users to judge detection performance by providing a preview and debugger UI for algorithm configuration and development. For ThirdEye users the UI overlays the time series of choice with ranges of detected anomalies and allows comparison of various configuration settings and tuning methods. This way any algorithm can be back-tested and evaluated against historical data quickly before deploying it for real-time detection. Furthermore, our users can often troubleshoot small issues with algorithms themselves without having to reach out for in-depth support. For algorithm developers the preview UI goes a step further and allows them to expose the internal state of the detection algorithm in the form of time series and other output and overlay it with the time series being analyzed. These capabilities have super-charged the development and iteration on detection algorithms for both the open-source distribution of ThirdEye as well as for algorithms tailored to specific internal data sets at LinkedIn. Algorithm development went from log scraping and break points to a visual debugger experience. Additionally, this visual debug output goes a long way in adding transparency to algorithm behavior for power-users and helps first-time adopters build trust in the technology. I hope this article gives you some food for thought for building your own detection algorithms and convinces you that “off-the-shelf” in ThirdEye already goes a long way for most of your use-cases. And whether you want to build algorithms yourself or rather observe the inner workings of existing ones, I’m sure ThirdEye’s preview UI will make your day. A big part of building distributed computer systems is delivering proof they actually work. Besides a live demo with shiny front-end and a polished slide deck, raw numbers are ultimately necessary to show that promises of robust availability, high throughput and low latency are kept during real-world use. And sometimes you may need numbers for debugging as well. My clear personal favorite for data analysis and visualization (and light programming) is Python, and in extension IPython Notebook, matplotlib, seaborn and the time-series analysis framework Pandas. Their integration has become seamless over the past years and they are very well suited for pretty much any task from quickly visualizing application logs to in-depth looks at time series and performing statistical inference. As examples for successful use of these tools I can offer our recent work on validated simulation of IaaS clouds and SLAs for spot instances. When looking closely at these publications the astute reader will find the giveaways of graphs generated with these tools. If you haven’t used IPython notebook yet, I highly recommend you invest 1-2 hours in getting familiar with the basics. Personally, it took some time to overcome my internal inertia and finally spend the time necessary – and I haven’t looked back since. It makes life quite a bit easier. I also had the opportunity earlier this year to talk to Brian Granger – one of the master minds behind IPython – and heard about the plans for expanding IPython’s scope with project Jupyter. I’m excited to see what’s coming down the pipeline in terms of high-performance analytics for those lengthy production log files we have sitting around. Pandas had a steep learning curve for me as well, but it took some time to get my head around some of the intermediate indexing and slicing techniques. As I figured this out, however, productivity shot through the roof. Importing text, csv, json and xml? No problem. Join three different data sets on different columns and get aggregate statistics a la SQL? Check. Plot intermediate results to debug heavy scipy use? Quick and easy. Things that took hours before get done in minutes now. It was well worth spending an afternoon to get familiar with it. Despite all this greatness, there’s a caveat. For presentation slides I still find myself falling back on Microsoft Excel for most visualization. Yes, I know my coolness factor just took a hit. The WYSIWYG (“what-you-see-is-what-you-get”) formatting capabilities are still more time-efficient than figuring out the various corner-cases of matplotlib calls. That being said, I usually prepare the data plotted with Excel using the aforementioned Python tools. Probably the easiest way to get it all set up is a pre-configured Python distribution such as Continuum Anaconda. An installation from scratch with pip and co is possible as well, but depending on your platform you will end up dealing with version conflicts manually. In case you run into any roadblocks there’s a solid user base for all these tools. This means that stackexchange.com is an invaluable resource for troubleshooting in addition to the official IPython and Pandas docs. In a recent effort to empirically evaluate a newly-proposed power-aware scheduler for private IaaS clouds we ran into problems obtaining accurate simulation results for two cloud testbeds we were working with. This prompted us to investigate an approach for creating validated, yet light-weight simulation models using an approach inspired by Perturbation theory. The approach augments a simple cloud model with measurements taken from a small subset of an actual production system to produce highly accurate predictions at scale. The “power manager” we investigate is designed to learn from and validate against production traces with multi-month time frames. The sheer duration of these traces makes it necessary to use faster-than-realtime simulation. Furthermore, we want to make predictions about the performance of the scheduler at larger scale than we can observe. Since we have to luxury of having access to two production-quality testbeds, we are also required to deliver a fully functional scheduler that handles workloads replayed on the real-world clouds flawlessly. This article is meant to be an accessible high-level How-To of our work on “Using Trustworthy Simulation to Engineer Cloud Schedulers” published at IC2E 2015. Our primary goal is to build light-weight simulation models for our two specific private IaaS clouds to evaluate the power manager. These “clouds” have with 5 and 8 nodes, respectively, and are very small compared to commercial cloud installations. Due to their small size we have the opportunity to get away with a simple model while still achieving high accuracy. Having a production system at hand, we chose an approach inspired by Perturbation theory and start with a parsimonious model (“solvable”, e.g. simple model derived from the architecture overview diagram) of our cloud. We then iteratively perturb (“refine”) the model until the desired level of accuracy is achieved. We lay out a minimal model with the end goal of evaluating the power manager in mind. The power manager draws on information on node occupancy and modifies the power states of individual nodes in our cloud. Hence, our simulation should accurately reproduce node utilization, occupancy, and power states and should allow for a plug-able scheduling algorithm and faster-than-realtime execution. Anything more than this is optional. Hence, we start with a simple model in which instance requests (and timer events) arrive at a scheduler which places instances on individual nodes. These instances then execute on the node for a fixed duration until they complete. Furthermore, the scheduler observes the system state in fixed intervals (epochs) and may hibernate and wake-up nodes as needed. From experience working with clouds we also decide to run the simulation in a Monte-Carlo-style fashion which allows for non-determinism when it comes to state-transition times and failures in the system. This is necessary since multiple runs of the same workload – on the same cloud – are still subject to concurrency issues and tend to create similar but not necessarily equal results. Our Perturbation approach then demands that we validate our model’s predictions at small scale – a single node in our case – against measurements of the real system. As expected, the prediction of the initial model diverge by a 15 percent margin and we enter our first round of iterative “perturbing” of the model. Looking at the logs of the production system versus the simulation, three types of unaccounted overheads stand out: instance setup, instance teardown and node power state changes. We extract these three overheads as variables for our model by storing their empirical distributions and later sampling them during the simulation. “Perturbing” our model by introducing these three variables indeed produces simulation results within 1 percent of the real 1-node cluster. But do these predictions hold when scaling up the simulation without collecting additional samples? For the avid reader, the unsurprising answer to this question is “yes”. Even predictions made for our cloud with all 8-nodes validate against out-of-sample (i.e. later) measurements taken from the real-world system, with an error in the 1-2 percent range. Interestingly, this “cloud-specific” model for our 8-node cluster is trivially portable to the 5-node cluster and produces equally accurate results by swapping out the three empirical variables with measurements from a single node of the other cluster. While these results are encouraging, a number of qualifications in order. Most importantly, scaling up a simple model cannot be expected to remain accurate for large systems. Shared resources such as network bandwidth or storage contention will put a cap on linear scaling sooner rather than later. Another aspect worth addressing is the assumption that nodes are homogeneous. Without this assumption, different nodes require different empirical distributions which increases model complexity and the required sample count. This may go to the extreme where each node is represented by it’s own samples, which defies the purpose of the approach. On the other hand, from a methodological perspective there are no restriction on “perturbing” the model further to account for these issues. A practical takeaway of our Perturbation experiment is that it is indeed possible to build a simulation model that scales with the size of an implementation effort. The parsimonious simulation model is manually designed by the developer, which allows qualitative considerations, and augmented with empirical measurements, which adds quantitative information. The subsequent real-world testing of a component developed with the help of this perturbation model then generates new insights and empirical measurements at scale, which in turn can be fed back into the model by iterative “perturbing”. My personal interest lies in the area of scheduling and resource allocation in IaaS clouds. Evaluating the effectiveness of a new scheduling algorithm is often only visible in over a long period of time, with heavy load on the system. When working with production traces spanning multiple months, empirical evaluation in real-time becomes infeasible. The academic community has picked up on this issue and produced a large variety of simulators that allow evaluation of schedulers in faster-than-realtime. For a taxonomy of evaluation methods for large scale systems, I highly recommend you to have a look at a Gustedt et al. survey from 2009. Looking specifically at the simulation approach, system evaluation is typically performed from a specific perspective – from the application or the infrastructure provider – and deliver accordingly tailored results. A subset of these simulators is presented below. Another, complimentary summary of existing work by Oujani can be found online as well. CloudSim. One of the primary frameworks used for simulating clouds in academic research. It is the brain-child of the developers of GridSim and has been used in a number of studies as it is highly customizable. Extensions to CloudSim include CloudAnalyst and NetworkCloudSim, which add a GUI and facilities for simulating geo-distributed applications, among others. GreenCloud. Built on NS2 it’s primary focus lies on exploring the impact of network layouts on cloud performance and energy consumption. iCanCloud. Focuses on predicting application performance, energy-consumption and cost with different hardware platforms and resource allocation schemes. MDCSim. A commercial entrant in the area, relying on detailed models of individual hardware components to produce predictions about a clouds performance at scale. The original publication targets 3-tier web applications instead of generic IaaS cloud infrastructures. DCSim. Simulates IaaS clouds with a specific focus on dynamic power- and SLA-optimization via VM migration. Its authors use tiered scale-out workloads and evaluate the advantage of VM migration and replication strategies over static provisioning. GDCSim. Primarily concerned with the thermal aspects of power-management in data centers by integrating existing modeling tools. Specifically investigates the interaction of workloads intensity and resource management policies with heat dissipation and fluid dynamics of different physical data center layouts. PICS. A recent entrant in the cloud simulation field, with a focus on accurate reproduction of job execution times and cost on public clouds from traces. EMUSim. Uses emulation of Bag-of-Task applications to extract performance properties and simulate their behavior at larger scale more accurately. An evaluation step ensures that emulation and simulation agree at observable scales. These simulator are typically based on discrete-event simulation, using compound models from smaller sub-models. This approach makes them highly customizable, but creates a significant problem calibrating and validating them against real-world measurements. Notably, while application-perspective simulator are published with results to validate their accuracy against measurements taken from real-world execution, this is step appears to be missing for most infrastructure simulators. They are thus mostly applicable to exploratory research and design studies rather than exact performance prediction. We commonly need to debug an implementation of a new cloud component. While a torrent of error messages in the system logs communicates the fact that the experiment did not work the way it was intended to, it is harder to determine exactly why this is the case. This becomes especially bad when the cause isn’t a simple programming flaw, but an issue with the scheduling logic or algorithm itself. The scheduler performs smoothly for two thirds of a trace we chose for testing and then fails spectacularly, just to return to back to normal towards the end of the experiment. Of course, the primary goal now is to understand what is going on (and going wrong) in the cloud. In addition to the classic “CDF-everything” approach, I find that I frequently come back to two visualization methods for the dynamic behavior of cloud workloads – the utilization graph and the lifetime graph. Representing the inner workings of a cloud in a visual format helps me immensely to interpret the information quickly. The following graphs are generated from the Eucalyptus private IaaS traces published recently, more specifically the “constant” workload data sets DS5 and DS6. These cloud workload traces are insofar interesting as they are recorded from commercial production systems and cover continuous multi-month time frames. Using the aforementioned types of graphs we will be able to dig up interesting details about the traces and solve the mystery of the failing SLA enforcement. The utilization graph I’m using here is a time-series graph with time on the x-axis and three series plotted on the normalized y-axis: utilization of CPU cores by IaaS instances in red, occupancy of physical hosts by instances in green, and the (here irrelevant) power state of the physical hosts in blue. Most helpful to our investigation is the red core utilization series. The trace indeed appears constant for most of the trace with a load spike plus a dip in the beginning, a short burst in the middle and another dip followed by a spike towards the end. The beginning of the trace is used as warmup-period for the machine learning scheduler and we’ll ignore it for now. The spike in the middle doesn’t throw off the scheduler, but the dip-spike formation towards the end matches with the timestamps of the observed SLA violation. In more detail, both node utilization and node occupancy show an extreme outlier within the valley to the right. While our look at the utilization graph confirms that “something” is going on here, it is not immediately clear why this causes the scheduler to trip. After all, the load drops for a moment just to return back to normal levels. The lifetime graph integrates a large amount of information, so please bear with me for a moment. Time is plotted again on the x-axis while the y-axis represents the instance index (details below). Each horizontal row (“life-line”) represents the lifetime of a single IaaS instance, broken down into three phases: setup, execution, and tear down. Finally, the color-coding is connected to the requesting user, but not relevant for our investigation at hand. Intuitively, the vertical ordering of rows can be interpreted as their launch order, i.e. instances closer to the bottom of the graph launched before instances towards the top. The horizontal indent of each row visualizes the absolute delay of the instance launch from the very beginning of the trace. Even with the bare eye you can typically identify clusters of instances with similar start- and stop-times, as they tend to group together in the graph. Examples for this are the long green cluster and the long red cluster in the bottom half of the graph. 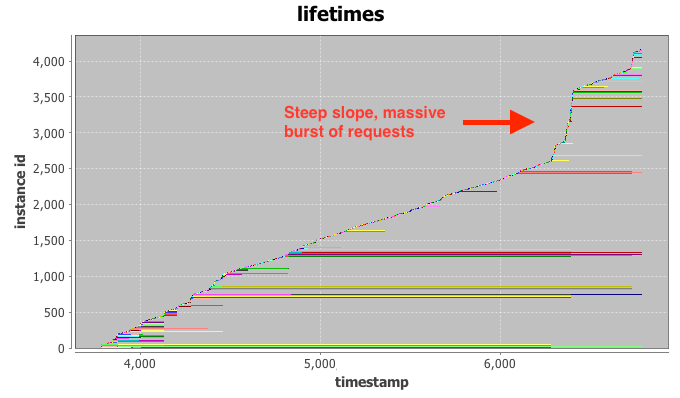 If a number of these request clusters start or terminate at the same time stamp, such as right after time stamp 4.000, this is a strong indication for a change-point in system (or user) behavior. We can already observe that a number of long-running instances stop at the same time around the 7.000 mark, just when our SLA enforcement fails. The final hint comes from the line created by newly added instance life-lines. For two thirds of the trace the “slope” generated by new lines is relatively even, indicating a constant arrival rate of requests at the could. This is what we would expect to see from the “constant” workload DS5 and DS6. At the 7.000 mark, however, the slope increases to almost vertical. This is the fingerprint of a massive burst of requests arriving at the cloud at once. Most of the launched instances only execute for a very short period of time and requests end up being issues quickly. This incident has the appearance of a runaway script that is supposed to replace some of the terminated long-running instances, but enters a rapid-fire request loop when failing to launch instances repeatedly. 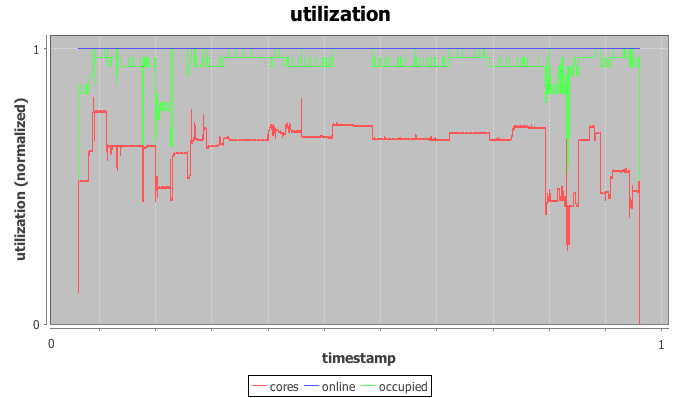 The initial drop in load causes the scheduler to launch additional spot instances in the systems. While the runaway script ramps up its request rates, more and more spot instances are launched, just to be immediately terminated by a flood of high-priority requests. Armed with this knowledge we are able to solve the mystery of our failing scheduler. We modify it to detect drastic surges and stay at the side-lines until the situation normalizes. More importantly however, I hope that the visualization methods presented above will help you with your quest for building the perfect cloud or, at least, catastrophe-free schedulers. Happy hacking. Only interested in the raw trace data? Skip to the end. Generating realistic cloud workloads synthetically has spawned an entire branch of research. My focus in this article is rather a practical description of the steps I personally take for developing and evaluating a new cloud scheduler. I usually start with a synthetic trace with job inter-arrival times and durations generated from an exponential distribution, with uniform core size – in our example a core count of 1 – for all requests. If the new scheduler doesn’t provide satisfactory results with this, it’s back to the drawing board. The next stage uses a log-normal distribution for arrival and duration, as this better models the long-tail properties of jobs encountered in real-world traces. A last extension for the synthetic traces then is the introduction of a non-homogeneous mix of instance sizes – which has been the demise of quite a few ideas. While the synthetic approach is a useful basic for testing, it does not re-create the kind of challenges that production traces pose, such as change-points in user-behavior, time-varying auto-correlation, and seasonality in the workload. When a scheduler prototype enters serious consideration, I am a strong proponent of using traces recorded from production systems for evaluation. Unfortunately, this is where evaluation becomes difficult. Besides handling the technological complexity of the scheduler, a logistical problem comes up: the scarcity of publicly available production traces. This can be a big challenge for the aspiring cloud researcher. I’ve listed a number of notable exception below, but generally companies in the cloud space either do not record utilization traces over the long-term or they heavily guard these traces and rarely allow the interested researcher a glimpse. If researchers do get access, they often cannot name the source of the traces and cannot re-distribute the raw data used as foundation for their work. This in turn creates problems with the reproducibility of results and slows down the overall innovation process. The desire to protect a company’s competitive edge is understandable, and yet the availability of anonymized traces would spark innovation and drastically support academic research. Google cluster workload. Published by Google in an effort to support large-scale scheduling research, these traces from a Google data center cell have attracted analysis efforts from a number of researchers in the meantime, e.g. an analysis by Sharma et al.. The trace covers a 1-month time frame and 12.000 machines an includes anonymized job constraint tags. Facebook Hadoop workload. A number of 1-hour segments from Facebook’s Hadoop traces published as part of UC Berkeley AMP Lab’s SWIM project. Some segments contain arrival times and duration, whereas others provide the amounts of data processed. OpenCloud Hadoop workload. Taken from a Hadoop cluster managed by CMU’s Parallel Data Lab, these traces provide very detailed insights in the workload of a cluster used for scientific workloads for a 20-month period. Includes timestamps, slot counts, and more. Eucalyptus IaaS cloud workload. Anonymized multi-month traces scraped from the log files of 6 different production systems running Eucalyptus private IaaS clouds. Published as part of a study by Wolski and Brevik. The traces contain start- an stop times for instances, their size and the node allocation as decided by the native scheduler. EDIT: We added the traces from our IC2E 2015 paper on trustworthy cloud simulation as well. Yahoo cluster traces. A number of data sets from Yahoo’s production systems. Most notably contains system utilization metrics from PNUTS/Sherpa and HDFS access logs for a larger Hadoop cluster. Additionally provides data sets with file access statistics and time-series for testing anomaly detection algorithms. TU Delft Bitbrains traces. Two data sets about VM allocation in a distributed data center focused on financial applications. One trace uses SAN storage, the other has a mixed population. Provides fine-grained cpu, memory, disk, and network utilization data over several weeks. Shen et al. analyze the trace. There are several other traces under “datasets”. CERIT-SC grid workload. Traces from a cluster running cloud and grid applications on a shared infrastructure. Contains traces with resource foot print, instance groups, and allocated hosts. Klusácek and Parák analyze the trace. Azure Public Dataset. Very large trace of anonymized cloud VMs in one of Azure’s availability zones. Contains cpu and memory utilization plus deployment batch size. Cortez et al. analyze the trace in their SOSP 17 paper. Alibaba Cluster Trace Program. Data center traces for VMs with batch workloads and DAG information. Contains a 12 hour and a longer 8 days trace, with cpu and memory allocation. Lu et al. analyze the trace. OpenCloud Hadoop workload. An analysis of CMU’s OpenCloud Hadoop workload as well as two other traces of data-mining and web-scraping workloads taken from production systems of a large internet company. Cloudera Hadoop workload. Similar to the above with data from production systems of anonymous Cloudera customers and Facebook and analyzed by researchers from UC Berkeley. Notably, most of these traces stem from Hadoop clusters and are limited to data-mining applications. More generic IaaS-type workloads can be found in the Eucalyptus traces and, potentially, the Google trace. I want to emphasize that these are very different types of batch workloads that can offer interesting insights in the behavior of a cloud system under varying conditions. I hope this short reference provides a jump-off point for both researchers and engineers to get their hands on a broader variety of production traces.